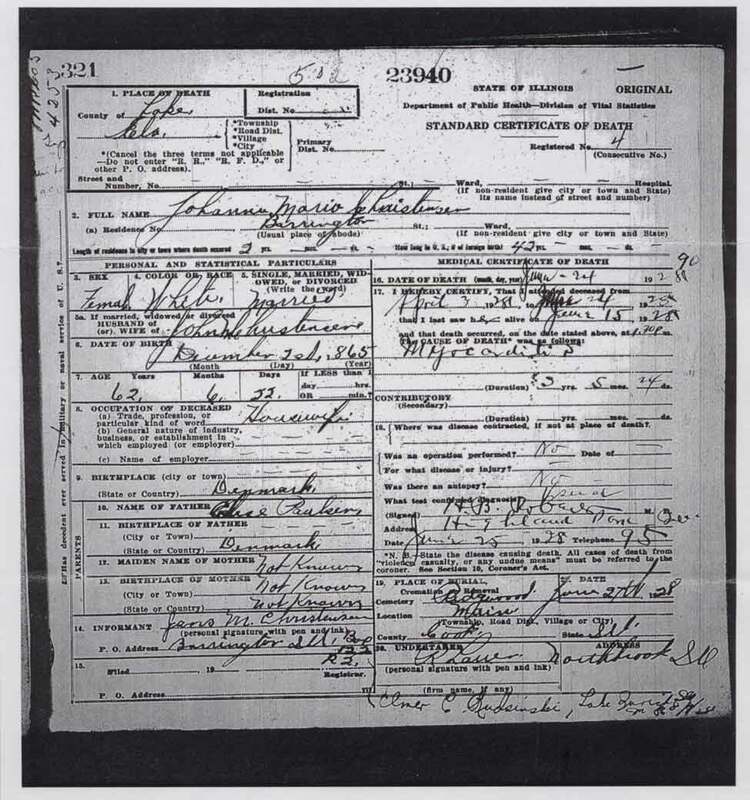 In the 1900 census Jens is a dairyman and stated that he had lived in the United States since 1883.� Jens and Johanne were living on Margretta St. In Pittsburgh. In the 1910 census Jens' occupation is listed as a teamster. The children at home on N. Atlantic Ave. in Pittsburgh� were Martha, John, Emma, Alfred and Victoria. Jens and Johanne had 11 children, but only 6 lived to adulthood. 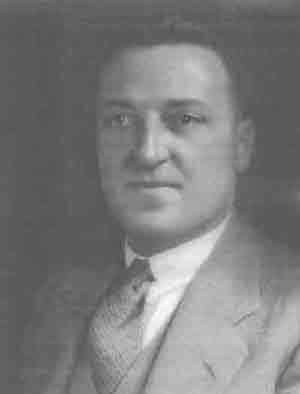 Death:����������� 8 May 1943, Highland Park, IL - Lake Co. 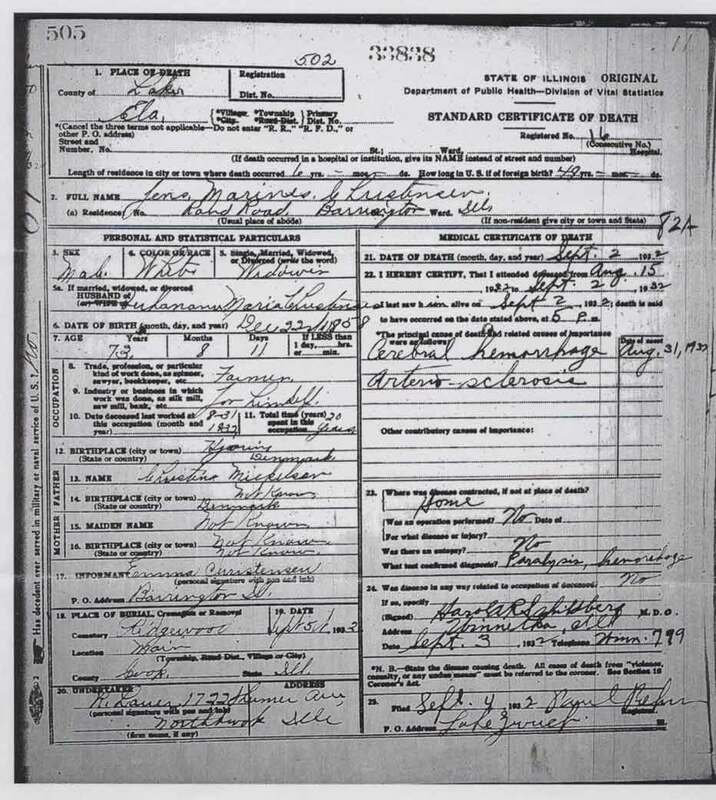 In the 1920 census, Harry and family are living in Deerfield, Lake Co. Illinois and employed as a gardener in the park.�� Found Harry and Martha, living at 611 W. Central Ave Highland Park Il, District 26 in the 1930 census. Death:����������� 23 Aug 1964, Barrington, Cook Co. Il - Rand Rd. From the Chicago Tribune: " Robert Mailfald, age 90, of Highland Park, beloved husband of Victoria C; dear father of Dorothy and Eleanor , grandfather of six; great-grandfather of 10." .Funeral was held at the Kelley & Spalding Funeral Home in Highland Park, Ill and interment at the Ridgewood Cemetery.